Both sites linked here are extensive lists of online tools for making assignment products. It is vital to begin to learn how to choose a tool for its properties and not due to your knowledge of it. There are times to go with the familiar, but death by powerpoint is not necessary. There are a lot of easy to use tools that will meet different needs depending on the work you are doing. Design Principles are key when creating products! Citation: Gutierrez, Karla. 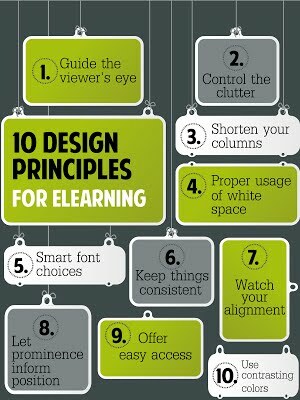 "Understand These 10 Principles of Good Design Before You Start Your Next ELearning Project." Web log post. SHIFT's ELearning Blog. SH!FT Disruptive Elearning, 19 Mar. 2013. Web. 17 Apr. 2013.